NEW EXTERIORS is a family owned and operated company since 2002, and we pride ourselves on our ability to provide exceptional workmanship for all your homes interior and exterior restoration needs. We have a highly trained staff including a knowledgeable office team, on-site estimators and consultants, supervisors, installation crews and service departments. A dedicated team will manage your job every step of the way to ensure quality workmanship and complete customer satisfaction. A NEW EXTERIORS sales consultant will come to your home and provide you with a FREE INSPECTION & ESTIMATE with competitive pricing and help you decide which products are best for you and your homes needs. Our sales consultants come prepared with examples and literature on all of our manufactures and provide only the most informative information to help you make the most suitable and best economical decision for your home. We offer FREE Inspection & Estimates. Virginia,West Virginia, Washington DC and Pennsylvania. 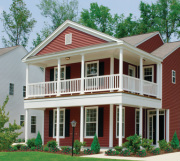 Vinyl and Hardie siding projects. brands and styles to suite your tastes and budget. New Exteriors proudly serves and is Licensed, Insured & Bonded in Maryland, DC and Virginia. We are also a members of the Better Business Bureau (BBB), the Building Trades Association.